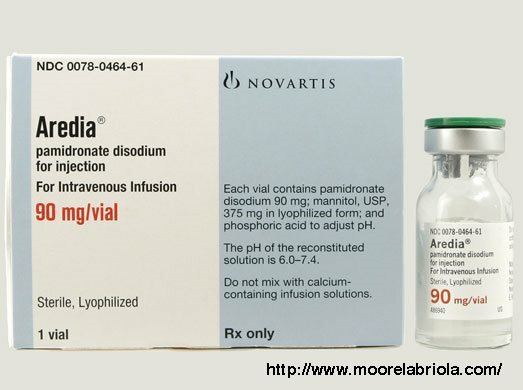 Aredia, also known as Pamidronate, is used to treat high levels of calcium in the blood that are associated with certain types of cancer and osteopersosis. It is also used to treat bone damage caused by myeloma or breast cancer. It is taken intravenously on a monthly schedule, often for the life of the patient. Aredia is a pharmaceutical product manufactured by Novartis. Are There Side Effects Associated With Aredia? As in many other pharmaceutical related lawsuits, the focus in primarily on products liability for failure to warn. As of 2010 there were 500 federal lawsuits pending and 150 pending in the state of New Jersey alone. Of the two that are conlcusive at this time the results are mixed. A Montana case accusing Aredia manufacturer, Novartis, of failing to give adequate warnings as to the risk of serious jaw injury found for the plaintiff and awarded her $3.2 million. On the other side of the country a jury found for the defendant, Novartis, and concluded that the defendant gave adequate warnings to her physician. Most recently Novartis was ordered to pay $12.8 million to a North Carolina woman who suffered severe damage to her maxilla and mandible after taking Aredia. What do I do if I have symptoms? The symptoms associated with osteonecrosis of the jaw include pain in the effected area and which can also progress to where there is difficulty chewing. Most often osteonecrosis has progressed far enough by the time it is diagnoseable. If you have been treated with Aredia or Zometa for cancer therapy or osteoperosis and have pain in your jaw that is continuous and seems to be getting worse you may have a case against Novartis for failure to give appropriate warnings. You should contact an attorney who specializes in pharmaceutical lawsuits and class actions immediately.